September 21st of this year marks the 40th anniversary of the signing of Proclamation No. 1081 by Pres. Ferdinand Marcos, which placed the Philippines under a state of martial law. According to the IBON Foundation, a combined number of 120,000 people have been victims of human rights violations, such as extrajudicial killing, enforced disappearances, warrantless arrests, political imprisonment, and torture. 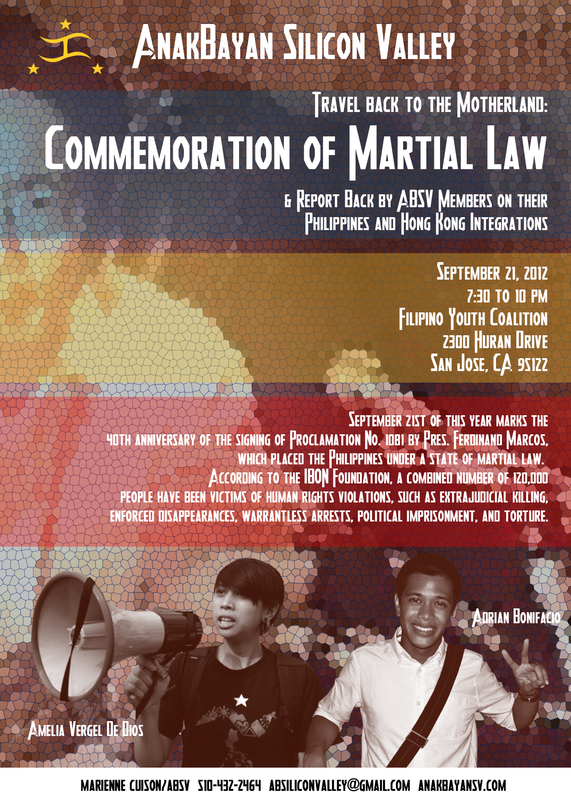 Join AnakBayan Silicon Valley in learning more about the situation of the Philippines during Martial Law, and the current conditions of the migrant workers in Hong Kong and of the different sectors (youth, workers, peasants) in the Philippines through two ABSV members’ exposure trip report backs. Get excited also for the cultural performances planned for the event. Dinner will be served for $5. Proceeds go directly to flood relief operations in the Philippines.